Ai no Uta ~ Pikmin CM Song - Single (愛のうた ~ ピクミンCMソング - Single?, lit. 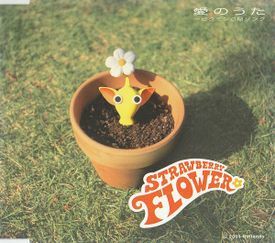 : "Song of Love") is a single by a Japanese image group called Strawberry Flower. This is their debut single that's A side, Ai no Uta was featured in Japanese commercials for Pikmin, and can be sung by the Pikmin in Pikmin 2 when 20 of each of the 5 types of Pikmin are in the player's group. This CD single remained in the top ten for several weeks. Unexpectedly, the single actually outsold the game itself[source needed]. About three months after Ai no Uta was released, the group continued with another single, Pikmin Dance, featuring three dance versions of their 2001 song, Ai no Uta. The title of the A side translates to Song of Love, so-named because the song expounds on the emotions the Pikmin feel in relation to their involvement in the game, and also their devotion to their given task of helping the game's protagonist, Captain Olimar. The B side, Namida ga Afureta, translates to The Tears Overflowed, and is phrased more from Olimar's perspective of the Pikmin as well as how he feels about them – which in turn seems difficult for him to express. In this song, the sorrowful space captain deeply regrets never telling the Pikmin that he loved them before departing back to his home planet of Hocotate. The third track is an instrumental version of Ai no Uta. Ai no Uta is also a music track available in Super Smash Bros. Brawl, played in the Distant Planet stage, along with a French version. The French version present in Brawl is incomplete, and a full version exists. Hikkonukarete, anata dake ni tsuite yuku. Kyou mo hakobu, tatakau, fueru, soshite taberareru. Demo watashitachi anata ni shitagaitsukushimasu. Sotto dekakete miyou ka naante. Demo watashitachi ai shite kure to wa iwanai yo. Motto ganbatte miyou ka naante. Pulled out again, we'll follow you alone. Today once again we'll carry, fight, multiply and be consumed. Left alone again, we'll meet again and be thrown around again. I guess it's time to play. Maybe we'll go out quietly. Today once again we'll carry, fight, multiply and then be consumed. Uprooted, we'll gather, and be thrown. On se multiplie et remplis d'énergie nous combattons vos ennemis. On est bien plus forts sur les chemins quand on est unis main dans la main. We are the Pikmin, we came to help you, (we are) your new friends. We multiply and full of energy we fight against your enemies. At your command we are ready to obey, we are the Pikmin at your service. Inhabited by thousands of creatures, often hostile. Ah..., ah... We are always here. We are watching over you like angels. We are stronger on the path when we're joined hand in hand. Together we're going to have fun, and we are the Pikmin to help you. This page was last edited on January 28, 2019, at 16:56.